Word counts, pixel size & other technical requirements. Artists & Writers: We are looking for Artists, Illustrators and Writers to join our growing team at Gaian Times! All may offer their products & Services on a Volunteer basis only. (see `Fee’s below). However, GT may allow certain amount of name-credit & page space for contributors’ publicity in kind. Feature Articles & New thoughts: on one of our regular Themes (Science, Magic, Psychology and Eco-related topics on Earth). Please check with Editor(s) for suitability of a particular piece, before writing. [Maximum 1,500 words = approx 3 pages of MS Word Doc. 1 Feature article per Contributor per Issue]. Comments, Letters & News items: All opinions and views welcome, as long as you understand that writers have their own freedom of expression. [upto 500 words per item / topic]. Art works & Poetry. - please submit only your own original work for which you hold copyright. Gaian Times will not take any legal responsibility if you knowingly or unknowningly break International copyright laws. Check with Editor(s) before e-mailing any works. [Maximum of 5 pieces of Art/photo with each 1200 x 1200 px or less. These will be shrunk to fit GT pages which are 950px wide ]. Affiliate submissions and overtly self-promotional contents , discouraged - these may be edited-out or may not be published! . The publication of any particular content does not mean the views and opinions expressed in that piece are the same of the Gaian Times or any of its Officers. Rather, it means that Gaian Times is encouraging though-provoking debate for the longer term benefit of society. We reserve the right to edit or refuse any and all Submissions, based on the suitability of submitted material towards furthering Gaian Times Aims & Objectives. Once a work is submitted, request for further editing by the author is accepted only at the discretion of GT Editor. 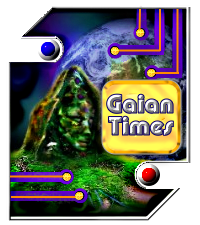 Occasionally The Editor may hold back a submission from publication, if it is deemed better suitable for another issue of Gaian Times. Chief Editor- Mani Navasothy’s decision is final in all cases. GT can not make any form of payment or fee to the author(s) for any submissions. We appreciate that people need publicity for their own products & ventures. It is usual practise for people / affiliates / agents / Reps of some products or services to write a feature article or an informational article about their product / service. Gaian Times will not publish an article or submission - if the `sales pitch’ aspects of its contents are deemed to outweigh the value it can offer our respectable readership! Any feature or content must have a `stand-alone’ benefit and value to our readership. If the article / feature is offering `free gifts’ or `discounts’ for a number of readers, we can accept informational pieces (Ed’s decision is final). For example, a Therapist may write about the benefits of a particular therapy. That is a `sales driven’ feature. However if that Therapist is offering a free session or discount at a session - specifically for one or more Readers of Gaian Times, then we will consider publishing the informational feature / article. We limit such reviews to a maximum of 1 or 2 items per Reviewer. In such cases, we also expect some tangible value to our GT readers (such as a a free gift of the item being reviewed ..to be offered to a GT reader.